he modern newspaper through its intensive, minute and zealous activities in searching out, presenting and interpreting each day the news of the entire world, is tracing with unerring accuracy the true and permanent picture of the present. This picture will endure as undisputed history for all time. Let us concede that the newspaper writer sometimes, in the passion of the hour, goes far afield. It is equally true that no statement of importance can thus be made that is not immediately challenged, answered and reanswered until, through the fierce fires of controversy the dross is burned away and the gold of established fact remains. Not alone the fact stands out, but also the world's immediate reaction to that fact, the psychology of the event and the man dominating the cause and the effect. The modern newspaper is the proving ground of history. To illustrate let us suppose that our newspaper press, as we know it today, had existed in Shakespeare's time. Would there now be any controversy over the authorship of the world's greatest dramas? Could the staff photographer of a Sunday supplement as efficient as one of our present day corps have snapped Mohammed in his tent and a keen reporter of today's type questioned him as to his facts and data, would not all of us now be Mohammedans or Mohammed be forgot? Had such newspapers as ours followed Washington to Valley Forge and gone with him to meet Cornwallis, would the father of his country be most intimately remembered through the cherry tree episode? Consider the enlightenment which would have been thrown upon the pages of history had a corps of modern newspaper correspondents reported the meeting of John and the Barons at Runnymede or accompanied Columbus on his voyages of discovery. Would not even Lincoln be more vivid in our minds and what we really know of him not so shrouded in anecdote and story? In Washington's time America became a Nation. In Lincoln's time our country was united and made one. In Wilson's time our Nation received recognition as the greatest of the world powers. It remained, however, for Wilson alone to reach the highest pinnacle of international prominence in the face of the pitiless cross fires of today's newspaper press. Yet this inquisition, often more than cruel, was not without its constructive value, for it has searched out every fact and established every truth beyond the successful attack of any future denial. 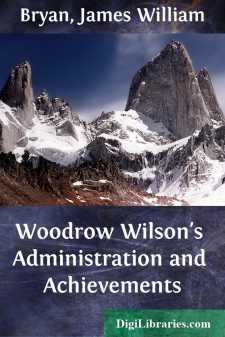 This little volume—the first perhaps of its kind concerning any man or event—presents with no further word of its compilers a summary of Woodrow Wilson's Administration and Achievements—eight years of the world's greatest history—taken entirely from the newspaper press.